Butter is a pantry luxury. It tastes very good spread on fresh homemade bread, baked into a cake, or seasoning a wholesome pot of Lima beans. In it’s normal state though it simply does not keep well without refrigeration. 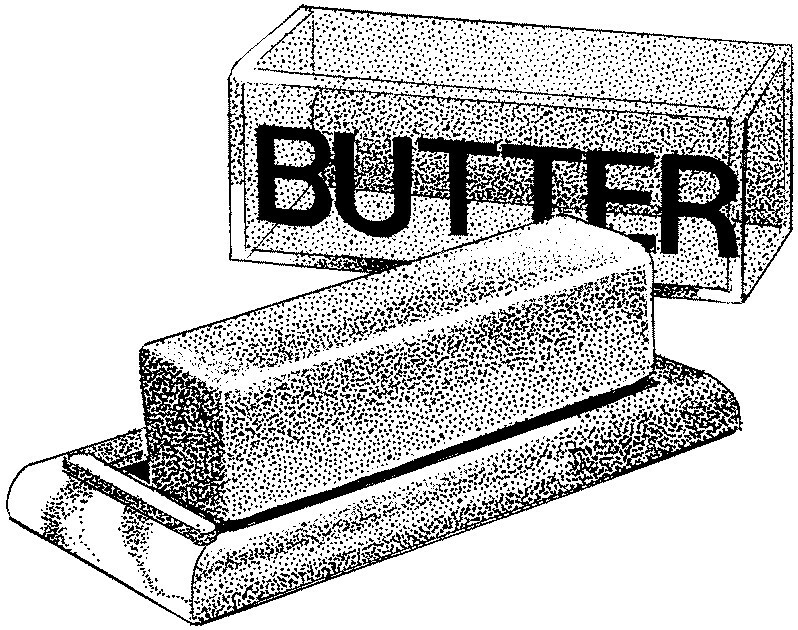 Commercially canned butter is available online. It can be used anywhere you would use regular butter. For longest keeping, this is your best bet. Another option is dried butter powder which is reconstituted with water. It can be purchased from almost anyone selling dehydrated foods packed for long term storage. It doesn’t work in baking, but is a delicious tasting spread. If you’re happy to use other fats such as oil and shortening for baking and frying and only need a spread for table use, dried butter powder is a real winner. Ghee, or clarified butter is an excellent alternative to canned butter. It’s been used for centuries if not millennia in India. Ghee was invented as a way to keep butter for a long time without refrigeration. This is accomplished by removing the milk solids and water from regular butter, leaving only the fat, which keeps a long time, even in hot weather. Ghee can be found in any market specializing in Indian Food. Some larger supermarkets also carry it in their ethnic sections. Compared to the price of butter it’s not particularly expensive. Unopened it keeps on the pantry shelf for at least a year, probably longer. Once opened it will keep perfectly well for several months, even in a hot summer kitchen. Ghee can be found in small 8-ounce jars all the way up to mammoth-sized gallon tubs. I prefer 16-ounce jars as a compromise between size and cost. If you have a place to keep it cool and only use clean utensils to dip out the ghee, then a large tub can be an economical choice. You can always keep the big tub in your cellar and then use a clean scoop to measure out small quantities, no more than a week’s worth at a time, into a separate dish to keep in the kitchen or cooking area. If you are able to find Ghee locally it’s probably the best compromise between ease, cost and keeping qualities. It’s my first choice of butter for my pantry. A final option is to can your own butter. I have done this and been satisfied with the results. Home canned butter is supposed to keep for 2 years but I have kept it a little longer than this without incident and have heard from reliable resources who have kept it safely for 5 years without any discernibly loss of quality. I personally prefer to rotate any home canned butter within 2 years. First get your canning jars. I use small wide-mouth jars that hold 8-oz each. You can buy them at Walmart or get them from you great Aunt Matilda, or you may have some around the house already. Do not use mayonnaise jars or peanut butter jars. You want real canning jars. Depending on how much butter you think you will be able to use before it spoils, you may choose from a variety of jar sizes. The smallest are 4-ounce, and will hold 1 stick of butter. 8-ounce jars will hold 2 sticks of butter and pint or 16-ounce jars will hold 1 pound of butter. I prefer to use 4 and 8-ounce jars for canning butter. This is a reasonable amount for me to use up after I’ve opened up the jar. Now, wash all of your canning jars and lids and bands. If you buy the jars at the store, they come with lids and bands. If you get them from Aunt Matilda, then go to the store and buy new lids and bands. Allow the jars to air dry. Bring a big pot of water to a boil. 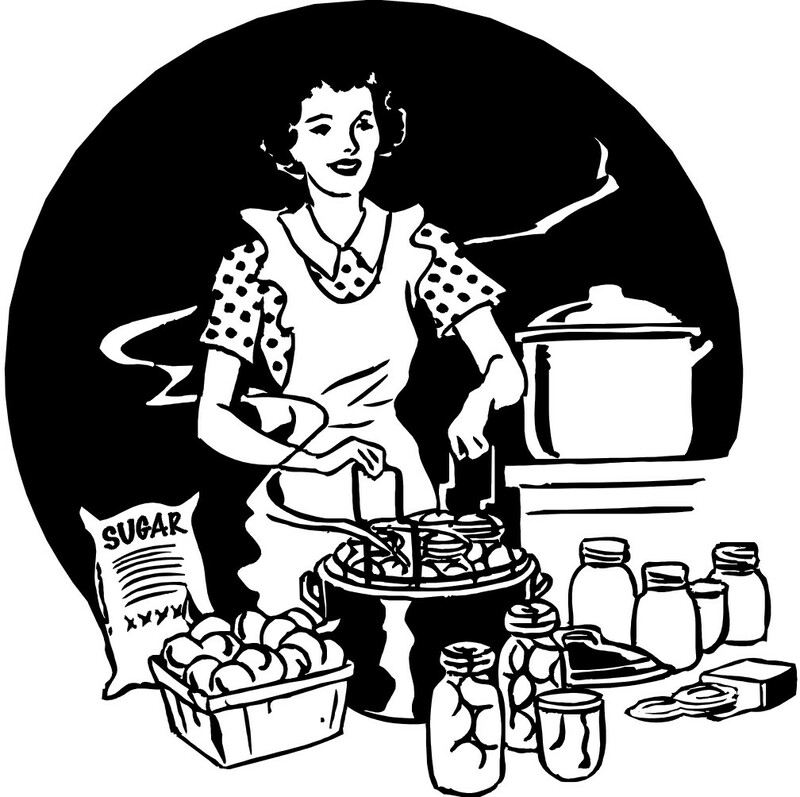 Place the canning jars inside the pot and let them come to a boil with the water. Allow each jar to become totally immersed in the boiling water for about a minute. Use your tongs to remove the jars and set them on a clean dishcloth, upside down, to dry. Continue until all of your jars have been boiled. Now turn off the flame under the boiling pot. Gently slip the lids and bands into the almost boiling water. Allow them to sit for a bit and then take them out with the tongs and put them on the dish cloth next to the jars. Now, in the medium sized pot melt your butter. Unwrap all of the butter that you wish to preserve. Each pound of butter will fill two 8-ounce jars. Each stick of butter will fill one 4-ounce jar. I usually process 4 pounds at a time. Heat the butter over medium low. Allow it to melt and bubble gently. The butter will foam on top, that is normal. Simmer the butter for 5 to 10 minutes to get rid of any excess moisture. Dip the ladle & funnel into the hot water to make sure they are sterile. Allow them to air dry. Place the funnel into a jar. Ladle up the butter into jar, until it’s mostly full. Do not overfill. You want about 1/2-inch of empty space at the top of each jar. Go on to the next jar and fill it the same way. Continue until all of your jars are full and your butter is used up. Now place a lid and a band on each jar. Screw them down firmly, but not overly tight. Allow the jars to sit overnight. They will seal automatically and the butter will harden. If you get a chance, shake the butter briskly while it’s cooling, to emulsify it and make it creamy. This isn’t necessary, but it makes the butter pretty. Store your butter in a cool place, preferably not close to the stove. I’ve heard that it will keep for 3 years this way, but I would stick with 2 years to be on the safe side. Be sure to label and date the jars with a permanent marker. Because of the cost and time invested in canned butter, I prefer to use it solely as a spread. 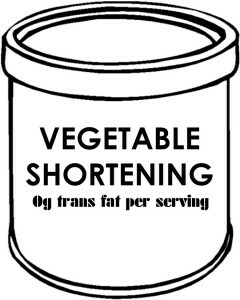 For all baking and even seasoning vegetables I use margarine or butter flavored shortening. This makes the butter last a lot longer. 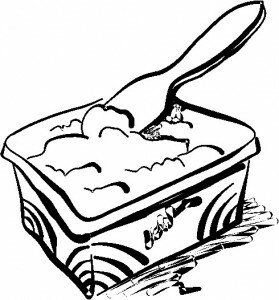 Margarine is a controversial food. Some folks love it, others hate it. It’s cheap and keeps perfectly well on the pantry shelf for a month or longer in cool weather. 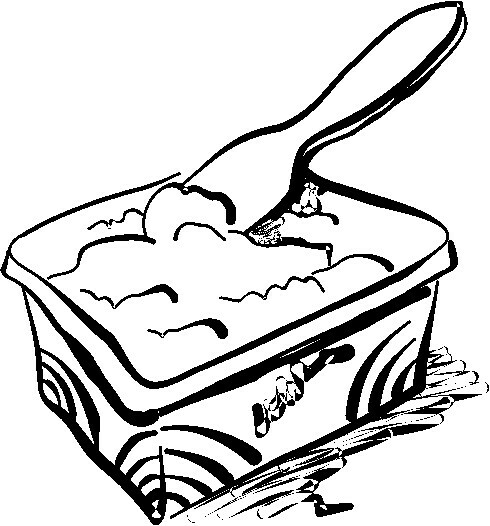 It’s happier and less messy when kept cool, but even hot weather can’t damage margarine significantly. Some people store several pounds in their freezer with the idea that if the power goes out, they can transfer it to their pantry shelf and expect it to keep reasonably well for several weeks. If you are living without electricity and are able to restock every 4 to 6 weeks, then margarine definitely has it’s place in your kitchen. In most recipes margarine can replace butter with perfect ease. I have heard of margarine being canned similarly to home canned butter and heard that the results are just as good. If you need margarine for long term keeping, this would probably be the best way. If you plan on using margarine mostly as a spread and have access to a hand crank blender like the GSI Vortex Hand Crank Blender, then you can make margarine yourself using the following recipe. This is one of those cool recipes that makes you feel like an alchemist in the kitchen. You do need a blender to make this recipe. 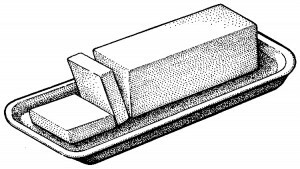 Non-electric blenders can be found at Lehmans or by Googling Hand Crank Blenders. Begin by measuring the dry milk powder, Butter Buds, salt and fresh water into the blender. Add the food coloring if you are using it and process the mixture for a few seconds. Remove the center of the blender lid. With the blender running, dribble in the oil in a thin stream. This is important. If you dump the oil all in at once, the recipe won’t turn out, so add the oil slowly. The mixture will thicken and become very creamy. When all of the oil has been added the mixture will be very thick. Turn the blender off. 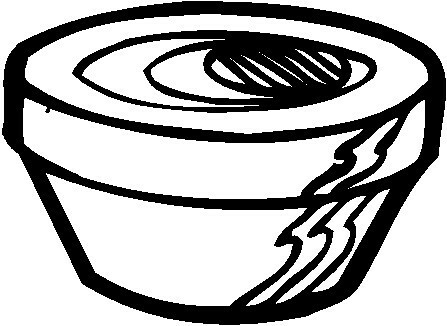 Scrape the margarine into a resealable container. You should have about 2 cups of margarine or the equivalent of a pound. The flavor of the oil is very important to this recipe. Only use fresh, high quality oil. Corn oil tastes good, as does safflower oil. Canola oil will work also, but I do not recommend soybean oil. I made it with soybean oil the first time because I had a big gallon of it I was trying to use up. The recipe turned out fine, but didn’t have the delicacy of flavor that it did when made with corn oil. I would not use olive oil in this recipe because of it’s strong flavor. If you do not have Butter Buds, then increase the salt to 1/2-teaspoon. Butter Buds give the margarine a light, buttery flavor that I enjoy, but not everyone does. Use this margarine as a spread and for seasoning vegetables. Do not use it for frying or baking. The water content makes it spatter when frying, and makes cakes fall when baking. Butter Flavored Shortening is a pantry staple. For replacing butter in baking it’s the best choice. Shortening keeps on the pantry shelf for well over 2 years without any deterioration. It tastes good, not like butter or even margarine, but still good, especially in baked goods, desserts and for seasoning vegetables. Plus, since it’s available in store brands it can be had economically. For frying it’s superior to butter or margarine while still lending that delicate buttery flavor to fried goods. Especially if you don’t store butter or margarine, you should have an adequate supply of butter flavored shortening for its psychological value and ease of use. The only drawback to butter flavored shortening is that it’s not especially good spread on bread. There is a way around this however, should circumstances dictate it’s use. Measure a level 1/4-cup of butter flavored shortening into a small bowl. Add the butter buds, salt, water and corn oil. Using a fork or a small whisk, stir the mixture until the water and oil emulsify with the shortening, and you get a soft, fluffy mixture. Use this as a spread on bread, toast, rolls, etc. It can also be used for seasoning vegetables. The flavor is surprisingly good. The texture isn’t quite as clean as butter or margarine. The shortening has a tendency to coat your teeth every so slightly, but the corn oil combats this quality to a great degree. When you don’t have access to fresh foods, this little factor is easy to overlook, but if you are accustomed to good quality butter, then you may find it takes a little getting used to, like switching to margarine. I do not recommend baking or frying in Almost Margarine. It would work in a pinch, but straight shortening works so flawlessly, that it seems a shame to go through all the work of making Almost Margarine when butter flavored shortening is so easy to use instead. Make this recipe in small quantities, and use within a few days. I don’t know how long it keeps, but to be on the safe side, make it and use it up, then make more as needed. By the way, when you begin stirring it up, for a moment or two, it seems like it isn’t going to work, that you will have a slimy, oily mess instead. Keep stirring. Within 30 to 60 seconds or so, everything will smooth together and take on a pleasing, creamy texture. I invented this recipe because I kept running out of powdered margarine and butter. I realized that I had a need for a good tasting spread that could be assembled from ingredients available at the grocery store, instead of having to mail order everything. The results were better than I expected. I find this tastes better than reconstituted margarine powder, and is much cheaper besides. The kids can’t tell the difference between this spread and regular margarine. It’s that good. Almost Garlic Butter: Prepare Almost Margarine as directed above except omit the salt. Stir 1/4 to 1/2-teaspoon of garlic salt into the spread, according to your taste preference. Use anywhere you would garlic butter. It makes great garlic bread and is also nice spread over biscuits or bread sticks, especially when they’re hot from the oven. Regular Shortening is not quite as versatile as butter flavored shortening, but it still earns it’s keep in a non-electric kitchen. Sometimes we don’t want the flavor of butter to interfere with a recipe and that’s where regular shortening has the advantage. It’s been used for frying foods for well over 100 years and performs well in baking too. Since it has such a neutral flavor it will never overpower the other flavors of a dish. While I prefer butter flavored shortening for many applications, there is still a place for good old-fashioned shortening on my pantry shelf. It keeps forever, costs very little and it’s versatility makes it handy to have around. 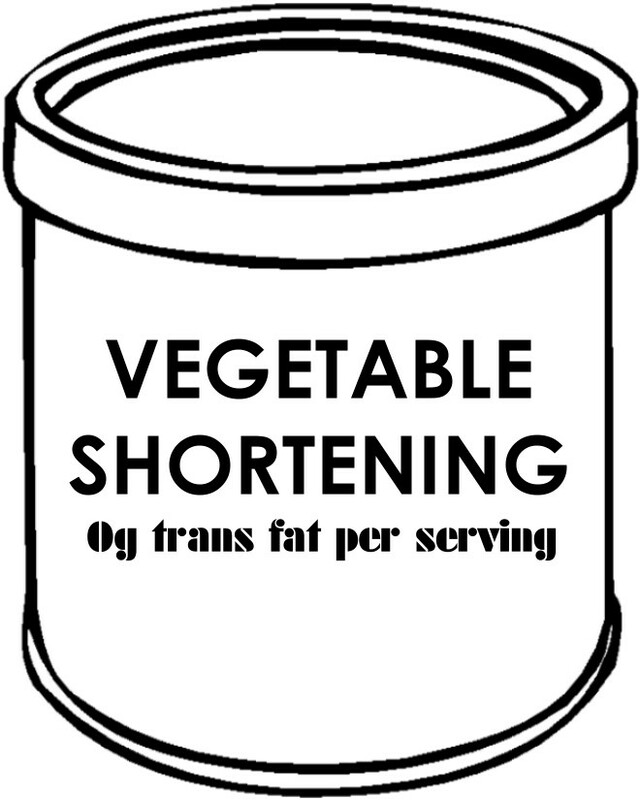 Read the label of the product you buy to make sure it’s all vegetable shortening instead of a blend of animal and vegetable fats. Vegetable oil is another pantry staple. Gallon sized bottles are usually more economical than smaller jars. The only exceptions to this are specialty oils like olive oil and dark sesame oil. Once opened these oils will only keep for a couple of months without refrigeration. For this reason they are best purchased in small bottles. Other vegetable oils like corn, Canola, safflower, peanut and soybean oil keep at least a year once opened, and perhaps longer if stored in a cool dark place. Before opening I count on these heartier oils lasting at least 2 years under good storage conditions. My personal preference is for corn oil because in my opinion it has the best flavor. My second favorite is Canola oil for flavor, health and economy. Peanut oil is best for frying because it can withstand high temperatures better than any of it’s cousins. Soybean oil is the perfect all-purpose oil and usually the least expensive. If cost is a primary concern then soybean oil is probably your best bet. Mayonnaise. When you’re working without refrigeration mayonnaise is one of the items requiring special attention. Common wisdom states that mayonnaise spoils quickly and is the cause of many summer picnic tummy upsets. This isn’t exactly true. Mayonnaise is a highly acidic condiment. It’s high acid content, along with the plethora of preservatives with which modern manufacturers infuse their products makes mayonnaise a lot safer than most folks assume. People who sail without refrigeration have long rejected conventional wisdom and kept their mayonnaise at room temperature. The women I’ve spoken with say there are a few tips to consider. First, buy small bottles of mayonnaise, preferably 8 or 16-ounce jars. Only use scrupulously clean utensils to dip mayonnaise out of the jar. Any dirty utensils will contaminate the rest of the mayonnaise in the jar. The women I’ve spoken with reassure me they’ve kept mayonnaise easily for a couple of weeks, even at room temperature. I consider this an option worth exploring should circumstances require it. It occurs to me that squeeze-bottles of mayonnaise would eliminate the need to scoop it out with a spoon. This would make it easier to keep the mayonnaise in the bottle clean until it’s all used up. If the idea or room temperature mayonnaise leaves you fearful of food borne illness, then there is an alternative. Restaurant sized packets of mayonnaise are available at Warehouse Stores like Sam’s and can be found online. Each packet holds about 2-teaspoons of mayonnaise, 3 packets would hold 2-tablespoons. The packets keep very well at room temperature. You only open them as you need them, so there isn’t any waste. They cost more than mayonnaise purchased in jars, but there is no waste at all. My husband can’t quite believe that mayonnaise is safe at room temperature, so this is the method we use most often. Mayonnaise packets keep for about a year, after that they become oily and the quality diminishes significantly. Another option is to buy 8-ounce jars of mayonnaise, use what you need and toss out any leftovers. 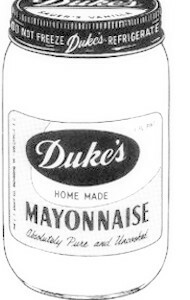 I know that Duke’s Mayonnaise sells cases of their 8-ounce jars for a reasonable price on their website. An 8-ounce jar of mayonnaise holds about 1-cup (or a little less). The last option is to simply make your own mayonnaise whenever you need it. You can use any standard recipe, substituting reconstituted powdered egg for a whole egg. With mayonnaise you really have to research the available options and choose the one that works best for you and your circumstances. Nonstick Spray is a convenience but not a necessity. Regular fats like shortening and oil work just fine for most frying. If you find yourself using nonstick spray regularly in your everyday cooking, then by all means feel free to make it a part of your pantry. If you don’t feel the need to store it, then it can safely be left out of your plan. If your main use of nonstick spray is to oil pans before baking, then simply rub your baking pans with solid shortening instead of nonstick spray. Solid shortening works better than vegetable oil at preventing sticking. Do you think you could use powdered soy milk in place of the regular powdered milk? Sorry Maggie I for got to say this is for the Almost Margarine, Buttery Spread. It is one of those days. I will try and get the right this time. It is for the Blender Margarine that I was wondering if I could use the powered soy milk in instead of powered milk. My brain was not working at all the day I did the other to messages.